While there is still some debate as to what degree a law officer’s age and inexperience contribute to deadly crashes, it’s broadly accepted that speed kills. Unfortunately, most conventional police pursuit training programs don’t successfully train officers to drive at high speeds in realistic, real life environments such as rural, city or congested areas. POST further noted that, over a given ten-year period, “7,100 injury collisions occurred [in California] … in which at least one party was a peace officer driver of a law enforcement vehicle.” In those 7,100 accidents, unsafe speed was the primary collision factor 35 percent of the time. When combined with the other two primary collision factors we get a clear picture that the leading cause of police driving injuries and deaths: The combination of fast driving and negotiating intersections. Neither of these skills—high-speed driving and dealing with “interference vehicles”—are sufficiently addressed in most police pursuit training programs. 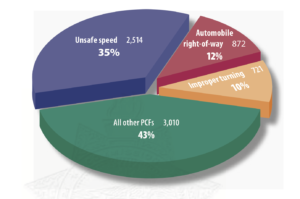 POST similarly found that a combination of speed and improper turning were likely the case of 45 percent of all police crashes. Tragically, few of these injuries and deaths occurred during a high-speed pursuit or either emergency situation. In any case, these numbers highlight a major shortfall in current police pursuit driver training courses: The focus sharply on building skills, and thus fail to teach good judgment.